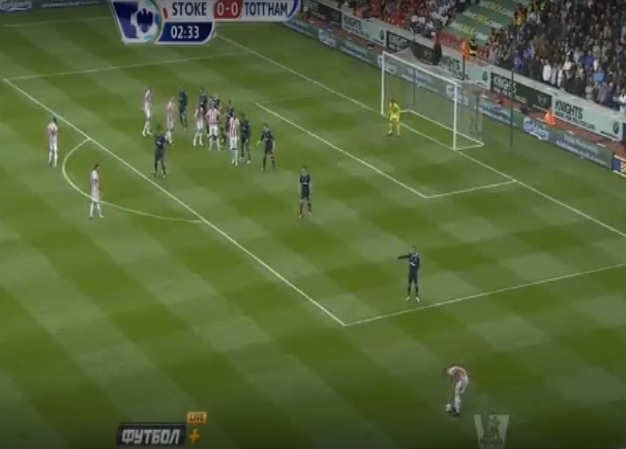 Steven N’Zonzi’s goal – A Charlie Adam free kick is shaped towards the near post, with three Stoke runners making moves beyond a static Spurs defence; N’Zonzi flicks the ball goal-wards, and Lloris is unable to keep it out, despite getting a palm to it. Adam seems to take a strange run-up, quickly placing the ball and dashing back – presumably indicating a near post delivery through a pre-arranged signal. Spurs line up to defend this set piece zonally. The runners start to make their moves as Adam runs up to deliver his cross. Parker, Bale, and Adebayor stand their ground in their zones, with Vertonghen man-marking in behind. Somewhat shamefully, the static Spurs defence let three Stoke players get in at the near post – Bale and Parker are ill-positioned to deal with the ball or the runners. Parker is too far forward, and Bale sticks to defending his zone, not reacting to N’Zonzi’s run across him to meet the cross. He has a ridiculous amount of space when he makes the header. For me, Lloris could do more – he gets a palm to the ball but still doesn’t keep it out. However, this goal has to be put down to the way that the set piece is defended – presumably we set up for a ball to the back post, not realising the threat that was unfolding at the near. Zonal or not, Adebayor still allows his 'man' to run in front of him, while doing nothing about it. Was Parker standing there just to take the ball in the face if the delivery was poor? A totally ineffective position. I'm starting to get quite annoyed about our 'defending' of set-pieces. Surely this has to be the most important area of pre-season focus. Way to blame the pencil after misspelling the word moshe. You drill to defend set-pieces that are inevitable. You don't drill on defending without fouling or ever giving the ball away. I'm sorry, but the person at fault is Bale and not Adebayor. This is not the first time it has happened either. Bale seems to be reluctant to get into the physical side of any such contest and is half-hearted in his challenges. I presume that zonal marking means you don't man mark and so Bale should have attacked the ball, at least blocking it. Lloris seemed to move in slow-motion for this one and appeared hesitant in the first half, which may have been due to the new back four with Caulker in it. Bale *should* be a very effective near-post screen as he is good in the air, but he does often shirk these sorts of situations. Bale started life as a defender, whereas Adebayor hasn't to the best of my knowledge. He is also not above criticism just because he has been our best player of the season. Defensive skill includes knowing when not to tackle, but this is missing from the English game. NZonzi is a midfielder... Bale's one of our best in the air, and could do more. What do you avoid against Stoke - Giving away unnecessary freekicks, corners or throw ins that enable them to put high balls into the box. Step up Clint Dempsey - what a ridiculous foul. Jill took the words right out of my mouth. Dempsey got owned in the corner a couple times. Thanks Windy. I'm not a fan of zonal marking, especially against team when everyone knows their main strength is set pieces. What concerns me even more is the number of free kicks we have given away in the final third this season, especially from wide areas. Walker in particular has been guilty of this, most likely down to trying to recover from his (correct)attacking full back tendency. We tend to be very clumsy/naive, don't we? I love nearly ever element of Lloris' game but agree that he can be a little better with reflect stops. If the Arsenal 0:0 Wigan draw doesn't happen as we all hope, I am suggesting AVB to use and keep the following lineup for all League Cup, FA Cup and Europa League games. Archer; Naughton, Stewart,Fryers,Smith; Livermore,Carroll; Ceballos, Pritchard, Mason; Kane or Obika. We've got 11 men in the area when the goal is scored. 3 at the back post marking nobody, 3 marking 4 in the goal and 4 doing absolutely nothing out in no mans land. Lloris should have saved it anyway. Back to the drawing board as they say. Agree on all points, Jimmy!